Remember the days when you would run out the door with no makeup? Ahhhh........I am now 41, and that does not really happen anymore. HydraFacial: better than a facial, less downtime than a laser or peel. Do you pay $200 for a facial? If so, it may be worth considering paying $250 for a HydraFacial, a special facial you can get from your dermatologist. This photo above shows clear glowy skin the day after my HydraFacial. The HydraFacial is a bit like an electric toothbrush mixed with a vacuum cleaner. The machine has different steps with different attachments. The process takes about 30 minutes with zero downtime. Side note-I have tried a Hydrafacial somewhere other than my dermatologist and did not experience as good of results. Lesson.....I wouldn't just go anywhere that has the machine. I go to Dr. Welsh & Dr. Hui in SF. Painless with immediate results, your glowy look will last about a week. They suggest a treatment every 6-12 weeks. The results will not be as dramatic as a peel or a laser, but the zero downtime is really nice. do we wear base now? commented on a girlfriend's skin the other day and she finally spilled the beans....she was wearing base/foundation. Do people wear base nowadays? Do you wish you had this perfectly glowy skin? Do you notice that when you put on makeup, you see fine hairs on your face? The Flamingo is the cure for peach fuzz. I just finished a 2 week cleanse. This is not an official program, I just made this up. Disclaimer: I am not great at cleanses or diets. I have tried this one before, and it does feel good. I noticed puffiness in my face start to subside after 2 days of not drinking. Jo Malone just opened up in our neighborhood. This product is sold in department stores, but not usually it's own store. Walking home from brunch, I passed by & decided to go in to check it out. I was greeted by a friendly face who offered me a complimentary 10 minute arm & hand massage. Yes, please! We talked through my fragrance preferences (rose, jasmine, gardenia, orange blossom), and with her guidance, we chose a few to combine for my massage. I walked out of there with soft skin & a fresh new scent. She suggests making your own unique fragrance by making a combination.....all of their "flavors" compliment each other. Below are the ones I am drawn to. It was a fun experience, and I will buy one to take on the honeymoon! Gift idea: gift card for a friend who can go to the store to make her own custom fragrance combination. The candles are lovely too! Stop by their store for the experience. You can't really choose perfume from online shopping. Which scents are your favorite? 2 things you should do at the start of a new quarter....change your Clarisonc brush & your mascara. These items should be replaced every 3 months. 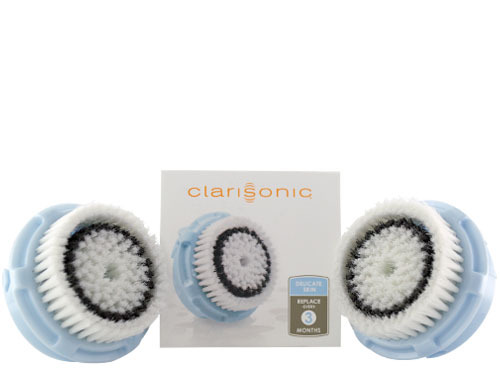 With our busy lives, it's tough to remember what you had for breakfast yesterday, let alone when you last changed your Clarisonic brush! I use the start of the quarter to remind myself. Sunscreen. We need it. Every day. Sunscreen does not last all day.....we are supposed to reapply every few hours. But who actually reapplies on a Tuesday at work? I remember when I'm at the beach....but during normal life, I put it on in the morning under my makeup, and move on with my day. So by 2pm I probably have nothing left. The solution? Powder sunscreen you can reapply during the day. Colorescience Loose Mineral Sunscreen Brush SPF 30 is a powder that provides SPF 30 sun protection. Small enough to stick in your purse, easy enough to reapply during lunch. Do you need to do this extra step before mascara? Probably. I was blessed with long eyelashes, and I use one every day. I believe in playing to your strengths!